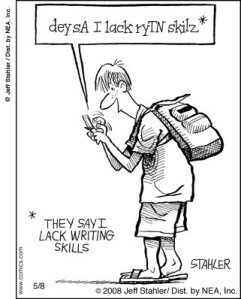 The time and place for your texting shorthand is not always what you think. This a guest post by Kristen Fife. If you’d also like to guest post here on JobMob, follow these guest post guidelines. A friend of mine in her 40's is just finishing up her PhD. Her focus is very much on the Digital Native generation (GenY, the Millenials) both in her research and her teaching. She posted a Facebook update that she has noticed that her written communications have become short and abbreviated, due to her heavy use of Twitter, texting her teenage son and her students, and using more shorthand in our connected world. My comment to her was that her communication skills are degrading, from a business perspective. I've noticed this more and more in the last few years as texting shorthand has become more prevalent and as IM is becoming more of preferred communication tool in the workplace. And I have to say, there is no excuse for poor language skills in any professional setting. It is one of the red flags that will differentiate a top candidate from a mediocre one. Fatal to your job search? From a job seeking perspective, most candidates stop at considering resumes/CV's and cover letters for their communications. But in today's tight global economy, recruiters and hiring managers are using tools like social media platforms as additional screening opportunities. For example, if you have a Facebook or LinkedIn profile and you use texting shorthand, that screams that you aren't really discerning about your external branding. The same with a blog. If you don't use proper grammar (one of the biggest examples I see of this in English is not capitalizing “I” to indicate the first person) and full, correctly spelled words then it indicates that you are more casual and somewhat sloppy in your work life. I belong to several groups on LinkedIn for both professional and personal interests. All these groups have discussion boards, and when someone posts a long response to an article or question and doesn't bother to communicate in formal, business English, I admit to immediately having a negative impression of them, regardless of the content of the response. So from a recruiting perspective, make sure that all your external written communications are tight, professional and convey a sense of maturity and gravity. Save the shorthand for your actual texting and social interactions. This article is part of the 4th Annual JobMob Guest Blogging Contest, which was made possible thanks in large part to our Gold Sponsor, Jason Alba of JibberJobber. If you want Kristen Fife to win, share this article with your friends. Subscribe to JobMob via RSS or email and follow me on Twitter for more insight about the skills needed for today's job search. Wow. I’ve been sending emails like this for the past few weeks. While using IM, I like to hit enter often to cut the waiting time for the other people and avoid them waiting for a whole long sentence. I’ve noticed my emails have become like this as well. Good thing to watch for. Another guide point/reminder is mentioning what facebook shows the outside world. I’ve tried to tell some friends to drop the farmville reports that have filled their status while they are looking for work. What employer is going to hire an expert at games? You could re-post or re-purpose the content of your post to the point of distraction and sadly the message would not penetrate. My Dad and a former English teacher boss, if they were still alive, would wince seeing my unintentional and egregious errors. But as Seth Godin says,”I ship.” Just as I am about to ship this comment, I keep trying to mimic continuous improvement about which we hear so much. Keep at it and I promise I am trying to do better than I did earlier this morning and the past few seconds. sQs Your newest advocate! Touche! Thank you for pointing this out to others. It’s the same thing as first impressions. Also, emails are forwarded on and you don’t know who else will see them. RT @jacobshare: How Texting Shorthand Differentiates Top Candidates From Mediocre Ones http://bit.ly/clO8EW. First impressions count.